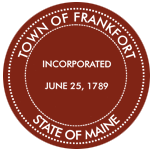 The town of Frankfort is in contract with Pinkerton & Son’s Rubbish Removal to pick up garbage on Thursdays. If a holiday falls on a Thursday, trash will be picked up on Friday. All trash should be out by the road by 7:00 AM. All trash bags/ cans need a Town of Frankfort trash tag affixed to the bag/ can. Please do not put money on the bags/ cans, the town does not receive those funds. Any bags/ cans without Town of Frankfort trash tags affixed to them, will not be picked up. Trash tags can be purchased at the Frankfort Town Office or Wilson’s Country Market. Please contact DM&J for disposal rates.